Picked up a cheap towel to use as thatching. 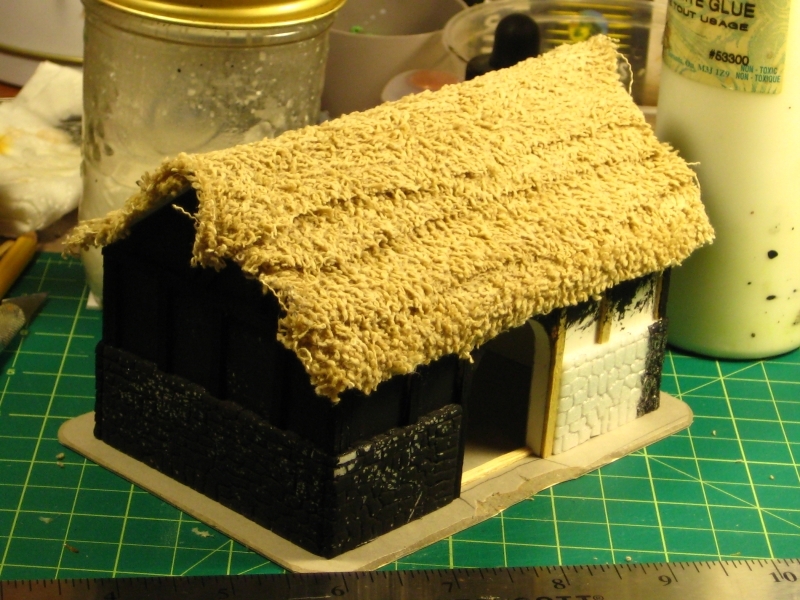 Here it is in a quickie late-night photograph, glue still wet on the roof of the half-timber barn. Towel strips as thatch on the half-timber barn. As usual, click for full size. The roof has a base of sheet styrene. I used white glue to stick the towel strips down, then more thinned white glue to soak the towel, which (when it eventually dries!) should solidify it nicely. The barn has also been given a base of mattboard and mostly primed. My usual scenery primer is a 1:1 mix of white glue and black paint, mixed right on the model. It seals and protects the scenery surface nicely, even fairly fragile stuff like styrofoam toughens up a bit! The main arched doors are also in progress, but I forgot to get a photo of them. Still to-do for the roof, trim the edges and glue them under the eves for a more finished look, then paint and more paint. I also need to do basswood rafters under the roof, both for looks and for actual structural support, as the roof will still be removable when this building is finished. The roof still looks a bit too towel-like right now, hopefully finishing the edges and painting will sort that!